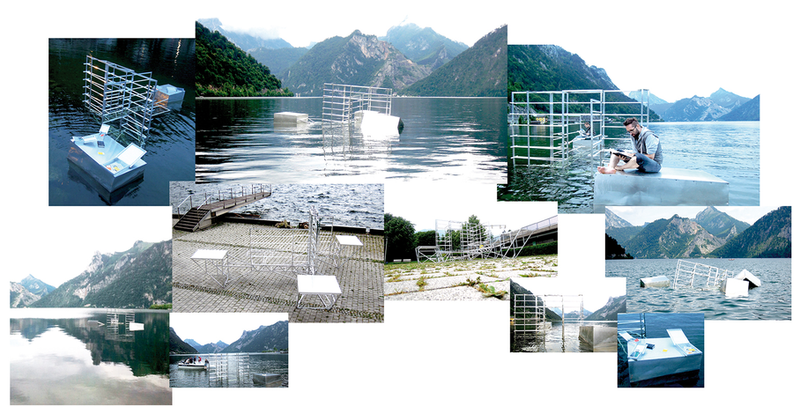 The 'Resurfacing' of the Arbeiterheim Ebensee’s library that sank in 1934. In the night of 22 to 23 September 1934, the right-wing paramilitary Heimwehr dumped about 800 library books from the local workman's centre in Ebensee in the nearby lake. This act of destroying disagreeable ideas demonstrated the power that the oppressors as well as the opressed ascribed to knowledge. After all, education promotes the understanding of one’s own social situation and social context. Information promotes freedom of opinion, and was considered dangerous and therefore fought by the undemocratic forces, since informed people are less prone to manipulation. The firm link between education, oppression and power forms the background against which the sunk library is brought to the lake’s surface again. The installation is accompanied by an audio-guide (12min) about the inicident’s historical background.